I see so many drivers veer from side-to-side in their lane, constantly crossing over the solid white line on the right and then crossing over, or driving on top of, the broken white, or solid white, solid yellow, and double lines separating the lane from oncoming traffic. Several drivers drive toward the center of the roadway and only move over when there is an oncoming car. Many drivers purposely drive over these lines when around a curve in the road. This may save two seconds out of your trip, but you're placing yourself in danger for merely two seconds. Do the oncoming drivers believe that you fell asleep, driving drunk, texting, or merely not paying attention and therefore, they think that you're heading directly at them causing a head-on accident? Stay in your own lane. Stop being a lazy driver. Note to young engaged females: If your fiancee drives like the above, runs stop signs, speeds and tailgates, ask him, 'If you keep driving recklessly that causes an accident and I lose a leg in the accident, will you still marry me." If he takes more than one second to answer, then the answer is NO. Don't be a cowardly passenger, speak up. It's your well-being at stake. 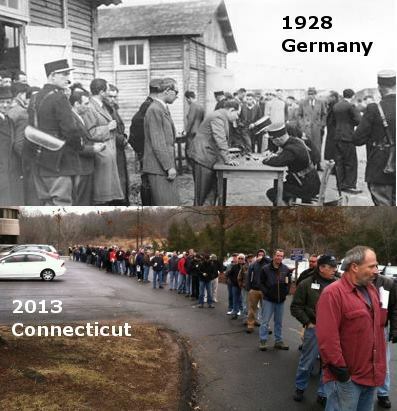 Note: People from all countries should take note of what happens when they turn in their guns. Less than 5% of the world population are citizens. You Panic, Instead of Steering Out of Trouble--Another Example. Several years ago while driving down a steep four-lane access mountain road leaving a ski resort in Colorado, I encountered a cross street. As the cross street was only two lanes, I thought that it was controlled by a stop sign, but it was not. The intersection was controlled by a red light high above the road. As I was on the downhill I didn't see it. Unfortunately the light was red in my direction, so the two cars on the side street from the left started coming out. When either my wife or daughter said that I had the red light, the first car was directly in front of me. At this time I had about less than 100 feet on a steep downhill, snow-covered, slippery road. If I had jammed on my brakes, (read panic), I would have skidded into the right side of the first car. At this point I'm assuming that the second car saw that I wasn't stopping, so he must have slowed down a bit and never got up to the medium divider on the highway. Instead of jamming on my brakes I steered around the danger. Taking my foot off of the gas pedal I put a slight pressure on the brake pedal. Not enough to stop the wheels from turning. This gave me steering control. The front car continued to move giving me a little more space behind it, so I was able to steer my car a few feet onto the roadway between the median divider and then back onto the passing lane avoiding the first car by approximately 2 to 6 inches. I was traveling at about 40 mph and never slowed down throughout the ordeal. That was the second time my mind went into slow motion allowing me the time to figure out what to do. When your mind goes into slow-motion you actually see what is about to happen, so you just do it. After the incident, my daughter said, "I knew that you wouldn't let anything bad happen to us." I wish that I had that much confidence in myself sometimes. I saw the aftermath of two accidents in the last two days. 1. Very black skid marks from the left lane up to the right lane, then none. Then van continued traveling off the right side of highway (4-lane access) through the fence and upside down in the field. That kind of maneuver is nearly impossible to perform except in a panic. Suggestion: Stop over-correcting. Take foot off of the gas and concentrate on steering out of the trouble, not on stopping. Ex. : Years ago while driving on a six-lane Interstate highway I ran over a tire. I didn't see it until the last second as it was wall-to-wall traffic. Unfortunately, the tire included the steel rim. I moved slightly left as I didn't want it to hit under me. Hitting the floor under the foot section of the passenger side, it lifted my car. I took my foot off of the gas and concentrated on steering out of trouble. I drove on two wheels for approx. 500-feet allowing the car to slow down by itself. I knew that if I oversteered or applied the brakes that I would land upside down. If I had turned the front wheel to the right I would have tipped over. I kept the wheel pointed slightly to the left. Luckily I had just enough highway to allow the car to drop back on its four wheels. I then continued to allow the car to slow down and when it slowed enough I drove it off of the right side of the road. Only then did I apply the brakes to stop it. The car was totaled. I was not injured--not even a scratch. Note: If you don't panic your mind will go into slow-motion, like mine did, and you'll have all the time in the world to figure it out, safely. What was probably 30-seconds seemed like 5+ minutes. (My mind has gone into slow-motion twice). 2. Four-way intersection at a red light. Car entering from the right, turning right, half-way into the intersection. The driver drives directly into the left side just in front of the driver's door. Did she push the yellow light? Most probably. Did he just assume that because the light turned green that he could go? Most probably. It is not illegal to go through a yellow light but in her case, she most probably only saw the yellow light and just went past the light never realizing that it had already turned red by the time she got to the cross street. It takes 2-3 seconds after a light turns red before the light at the cross street turns green. Suggestions: 1. Stop pushing the yellow light. 2. Count to three after the light turns green before starting out. And if there is a car still in the intersection, don't run into it. Don't merely look but actually see what is in front of you. look - to turn one's eyes toward something. Shouldn't be merely at the light but also on the road ahead before you start up. see - to perceive with the eyes; To understand what is ahead; thereby to be able to avoid the danger. Ask yourself. Was the 3-seconds spent at the intersection better than the days or weeks that your damaged car will be in the repair shop? Would the 3-seconds spent before leaving the intersection make a difference in the time that you would have arrived at your destination? Was pushing the light worth the accident? The only time a gun owner will cut in front of the line is when he'll register or surrender his guns.